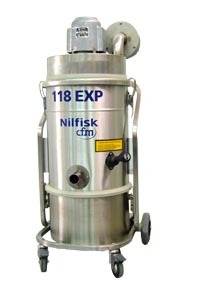 The new 118 EXP is a CSA-approved explosion proof vacuum cleaner that meets requirements for use in Class I, Group D, and Class II, Groups E*, F, and G. The vacuum is designed for collection of dry materials only. (Another version of the machine, the 118 EXPW model is designed for wet material collection only). The new 118 EXP is a CSA-approved explosion proof vacuum cleaner that meets requirements for use in Class I, Group D, and Class II, Groups E*, F, and G. The vacuum is designed for collection of dry materials only. (Another version of the machine, the 118 EXPW model is designed for wet material collection only). Constructed of 304 stainless steel, the 118 EXP features optional HEPA or ULPA filtration.brbr*Collection of commerical alloys is subject to individual approval by our application engineer. Non-sparking, conductive accessories are available to meet a wide range of needs.